What do Forrest Gump, horses and music have in common? What kind of music do animals like? Can cows tell the difference between classical and rap? Which animals are partial to a bit of REM and what do Forrest Gump, horses and music have in common? Science has the answers! Before my first child could even speak we had noted her reaction to music. Just having the radio on in the background we often observed a change in her posture or mood depending on what was playing; in fact, we frequently had to turn off the radio when a slow or sad tune would reduce her to tears. This has fascinated me ever since, from the effect of music on our mood, our health, and our brain development. I never gave much thought though to the effect, if any, of music on animals. That is, until today. A good friend called round for a chat and fascinated me with something she had heard on the radio about the effect of the theme tune to Forrest Gump on the emotional state of horses. My interest was piqued. With a little research, it seems many animals respond in different ways to different types of music, just as we do. And for the animals that have no interest in ‘human’ music at all… there is now species-specific music created just for them! It would appear that cats are not terribly impressed with any of the music composed for our human ears. They show little or no reaction to it. However, this prompted a small team of scientists (Snowdon and Savage) and a composer, David Teie, to look at just what might appeal to our feline friends. With much study and research, they created music with cats in mind, composed of tones, pitches and frequencies that would most appeal to cats, and mimic what is in their natural environment. They have reported that the cats they studies showed an increased interest and preference in the species-specific music (with greater positive responses in younger and older cats when compared to middle-aged cats). Many farmers know that playing music to their cows keeps them calm and happy during milking. In 2001 a study run by a group of Psychologists from the University of Leicester, UK, played music of different tempos to herds of more than 1,000 Friesian cattle. The results were impressive: they played a variety of music, from slow, classical, techno and rap to the animals for 12 hours a day, over nine weeks. While they found no increase in milk yield when playing fast tracks to the cows, they reported a 3% increase in each animal when slow music was played; that is about 3/4 of a litre or one and 1/2 pints of milk extra per cow, per day. What tunes did the cows seem to enjoy the most? “Everybody hurt” by REM and “Bridge over troubled water” by Simon and Garfunkel were apparently popular for increasing milk yield and keeping the ladies calm! Based on this knowledge, the British Columbia Dairy Association decided to jazz things up a little by inviting people to compose some mellow cow tunes and enter them into their “Music makes More Milk” contest. Finalists had to impress the jury of five Holstein cows. The winning tune (if you really need to know) was titled “A Moo down Milk Lane”. Moving on from bovine Moosic we finally come to the horse part of this story! What do our equine friends think of our human music? A 2015 study on purebred Arabian race horses looked at the emotional and performance levels of the horses when exposed to classical music in the stable area. The initial results of the study suggested that the horses exposed to classical music exhibited reduced stress levels (determined by measuring cardiac activity variables) and an increase in performance (as measured by their overall wins). These observations peaked at the two to three-month phase of the study and then dropped back to normal levels over time (suggesting that the horses became accustomed to the music and it had less effect). The music used in the study was specifically composed with horses in mind. What about human music? A 2013 study tested horses’ emotional responses to classical, country, rock and jazz. The results from this small study suggested that classical and country music had the most calming effect on the animals tested and the fast tempos and minor keys of the jazz music put the animals more on edge. From specific genre to a specific piece of music… the Forrest Gump theme tune. This classical piece, by Alan Silvestri, was chosen for its ‘repeatability’. The study was carried out using horse from the French National Stud. 48 horses were fitted with newly designed horse headphones; half of the horses were played the Forrest Gump theme tune while travelling in horseboxes; the other half were played the music while being shod by a farrier. Both these events will typically increase stress indicators in the animals. And the results? The horses that were played music during transport showed the greatest reduction in stress indicators. This could be very good news for trainers and owners of horses that often have to travel internationally for events. The effect in the animals that were being shod was less effective, although both groups showed a quicker heart rate recovery afterwards. Personally, I find these results fascinating. I grew up around horses and found them very sensitive creatures, in tune with everything in their surroundings. I love the idea of reducing their stress in any way possible. And I listened to the Forrest Gump theme tune while I wrote this piece, it certainly brought me to my calm place! What do you think? Have you ever noticed a pet respond to a particular type of music? What kind of music was it? Or what favourite piece would you like to see used in these experiments? Have you any favourite animal music stories of your own? Let us know in the comments below! 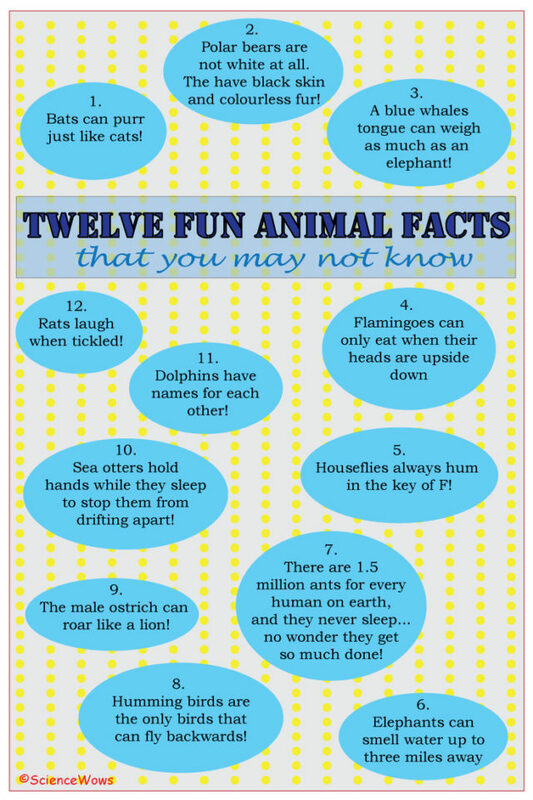 12 Fun animal facts that you may not know!